A sunrise is one of the most magnificent natural events that one can witness. 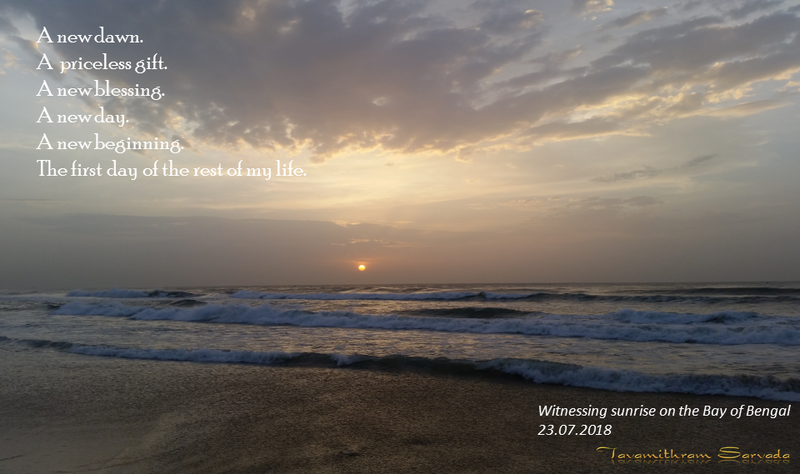 During my visit to the south of India, I was blessed with such an opportunity to watch the dawn of the 23rd of July 2018 over the Bay of Bengal. According to Dharmic scriptures and traditions, Aditya or Surya the sun, is revered to be the One that represents the visible form of the Divine. It is believed that worshipping the sun can help one in building immense mental as well as physical strength in them. It is an exhilarating experience to chant or listen to the chanting of the powerful Aditya Hridayam Mantra [ https://tavamithramsarvada.wordpress.com/aditya-hridayam/ ] whilst witnessing sunrise. The energy, the hope, the power, the courage, the sheer optimism it fills the heart and soul with, are simply remarkable. However stressful the state of mind of a person may be, due to whatever troubles they might be facing in life, spending those few golden, invaluable, magical and awe inspiring moments witnessing a sunrise along with the power of the Aditya Hridayam Stotra, can simply crush and destroy all negative thoughts in them giving way to an experience of Divine Bliss, positivity, courage, grit and the buring desire to brave all odds and emerge successful. 16. O Pushan the nourisher, O lonely Traveller of the heavens, O Regulator of everything, O Sun – the son of Prajaapati, gather up Your effulgence in order for me to see Your glorious form. The Highest Purusha who dwells in You, that I am. 17. May the vital force in me merge with the all-encompassing Praana or cosmic energy and may this body be burned to ashes. Om! O Agni! O Supreme One! 18. O Agni – the Bright Being, lead us to the right path to enjoy the fruits of our actions. Remove from us delusion and sin. We offer You in salutation again and again, our words of adoration for You. May the Divine Grace of the Supreme Being descend upon everyone and may the world be filled with peace, happiness and prosperity.